Although we have been planning the next installment of 1812: Commemorating the War: Celebrating the Peace since before we returned from last years incredible voyage, the recent crossing from Burlington to Plattsburgh was an unexpected experience. The challenge of getting the three boats ready, creating the interpretive materials that connects the travel to the mission, coordinating logistics with over 40 communities in two countries and securing the essential sponsorships that empower us to continue this mission has been so intense this year that by the time the “meeting on deck” took place at 8:00 AM on Friday, May 31st, I had not focused much on actually traveling. 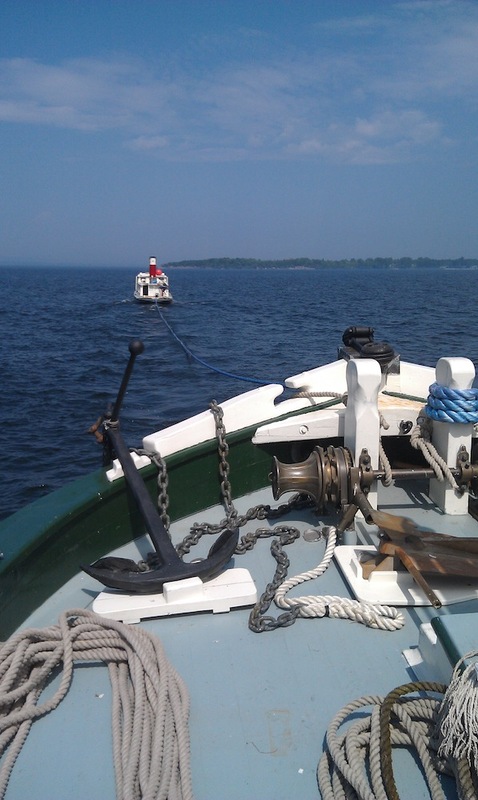 However, all the preparation was apparent as our veteran crew of Captain Roger, Erick, Tom, Kerry, Len, Chris McClain and Carolyn Kennedy began to tow Lois out of her slip at Burlington Harbor and turned north towards Plattsburgh, our first stop of this 40-community 2013 tour. 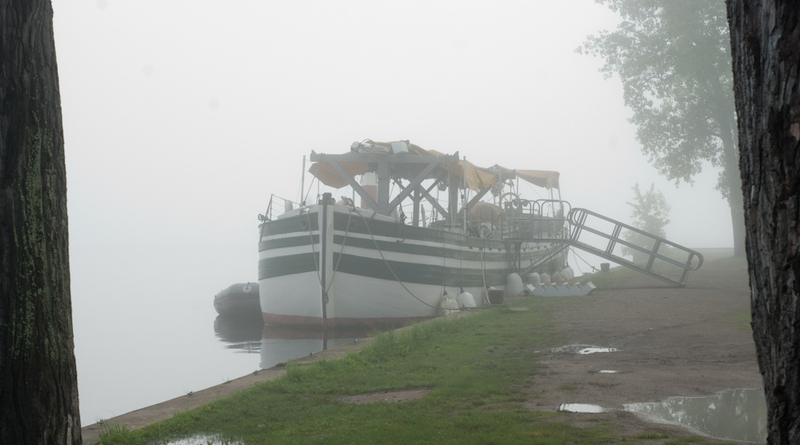 With land fading behind and the broad lake appearing out the tugboat’s pilothouse windows, we began the journey that will take us as far west as Buffalo then back home via Oswego, the St. Lawrence River to Montreal and the Richelieu River back to Lake Champlain and home. Our focus this year is to present the highlights of the 1813 campaign and traveling to Buffalo on the western end of the Erie Canal and whose harbor connects to the eastern end of Lake Erie seems the perfect destination to remember the 200th anniversary of the American victory at the Battle of Lake Erie. By 1813 it had become clear to both sides that control of the Great Lakes was the key to success and a shipbuilding contest testing the skill, resolve and resourcefulness of each side began. By September 10, 1813, the two squadrons on Lake Erie were ready for battle and the American fleet under the command of Oliver Hazard Perry won the day over their British counterparts. Sailing with Captain Roger, a descendant of Commodore Perry’s, we will interpret this important event and the people, ships and shipwrecks that were involved. We will tell the story on the Battle of the Thames, where Shawnee Chief Tecumseh fell and William Henry Harrison rose, and the failed American attempt to take Montreal via Lake Champlain and the St. Lawrence River. We will explore the fierce action on the Niagara Peninsula just before the 1813 campaign came to an end. Our discussion of 1813 will help set the stage for 1814, the final year of the war, and the decisive land and naval Battle of Lake Champlain that helped bring the War of 1812 to a negotiated close. Heading toward Plattsburgh at our normal traveling speed of 5 mph, this year’s tour began to be very real to me. It was as if someone turned a switch and I found myself transforming from a hectic land person to a slow-moving nautical historian. As I watched Captain Roger lay out a course to take us west of the dangerous Colchester Shoals my mind turned to the familiar but dormant story about the burning of the 1819 steamboat Phoenix. I had just had a conversation with Erick about Ernie Haas, maritime painter extraordinaire who was opening a show of his art at the museum. Ernie has been the master at translating historic episodes into a visual image for almost two decades and the “Burning of the Steamboat Phoenix” was one of the first of a series of dramatic paintings Ernie did for us. This painting and many others will be on exhibit at our Basin Harbor’s Owen Gallery until mid-summer. Now as we passed by the final resting place of one of the world’s earliest steamboats, the circumstances of that disaster came flooding back to me and reminded me of another connection to the War of 1812 story. The Phoenix had been laid down in Vergennes soon after Commodore McDonough’s stunning victory at Plattsburgh had secured the lake. In 1815 Phoenix began traveling the long lake route from St. Johns to Whitehall, proudly demonstrating the superiority of steam over wind-power. That message was apparently not lost on the lake sailors who resented and feared the new technology would bring an end to their way of life. So it was that on a nighttime passage from Burlington to Plattsburgh, the Phoenix was engulfed in fire and her sleeping passengers and crew were thrown into the terror of survival. The two lifeboats were partially filled and sent to Providence Island but a dozen passengers and crew were left aboard the burning steamboat and of those six perished. It is now almost 200 years since the end of the War of 1812 and as we pass the Phoenix’s resting place we are heading to Plattsburgh, the scene of the most important military victory of that war. Our mission is to interpret 1813 and the canals that were born shortly after peace was negotiated. I wanted to begin in Plattsburgh because of its intimate connection to the 1812 story, as well as to take part in Clinton County Museum Weekend. This weekend is when all the wonderful museum’s of the county are opened to the public for free. As it turned out, this was a perfect way to begin this years journey. I was able to connect with many old friends, divers, historians, museum worker and we saw over 300 enthusiastic visitors aboard the Lois McClure, our historical time machine. Its always so rewarding to see how pleased and satisfied the visitors become which, in turn, excited our veteran crew. 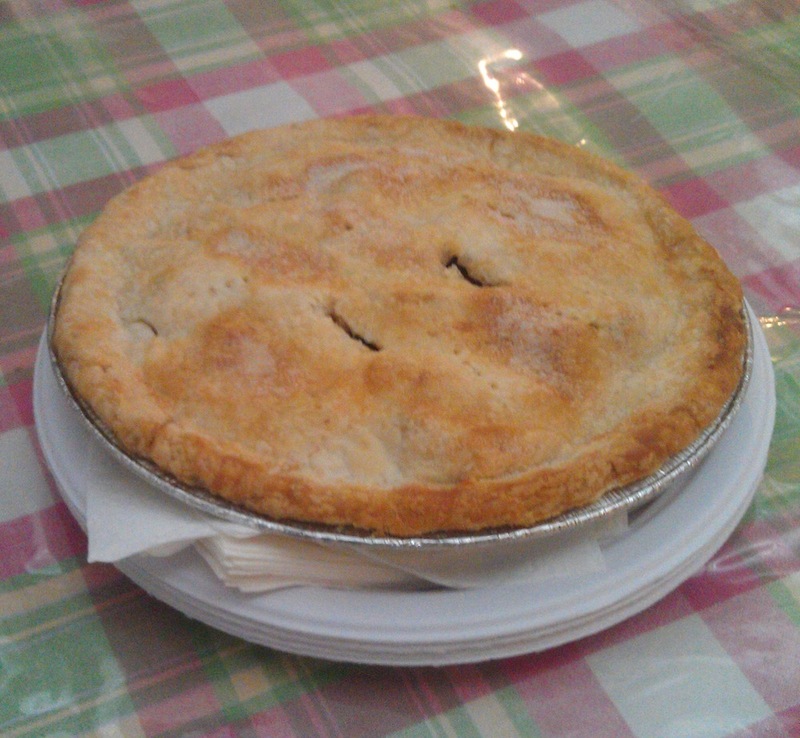 Apple pie fresh from the oven, courtesy of Bey and Bill Leege. Young, old and everyone in between seems to appreciate the stories about shipwrecks, canals and canal schooners, war and peace, hard working families, trucks and interstates and canal boats and interconnected waterways. It still surprises me how well these stories resonate with our visitors. Their smiles, comments and questions make all the effort worthwhile.The warm apple pie from Bev and Bill Leege and the donuts from Mayor Don Kasprzak added to our sense of connection with the community. This wonderful first port-of-call has energized this crew to look forward to the next 4-months and thousands of conversations we expect to have. We leave this morning for Basin Harbor and two days of final preparation then point the boat to the canal to begin the working our way south and west to connect with Lake Erie and the battle that brought the American’s a much needed victory.